Bachelet, who was the former president of Chile, delivered her first speech as the UNHCR chief on September 10, which was welcomed by several JRL members in Kashmir. Michelle Bachelet, who took the charge of the new Human Rights Chief on August 8, delivered her first speech to the UN on September 10, in which she slammed India for lack of any ‘meaningful improvement’ on addressing issues highlighted in the UN report on human rights violations in Jammu and Kashmir. 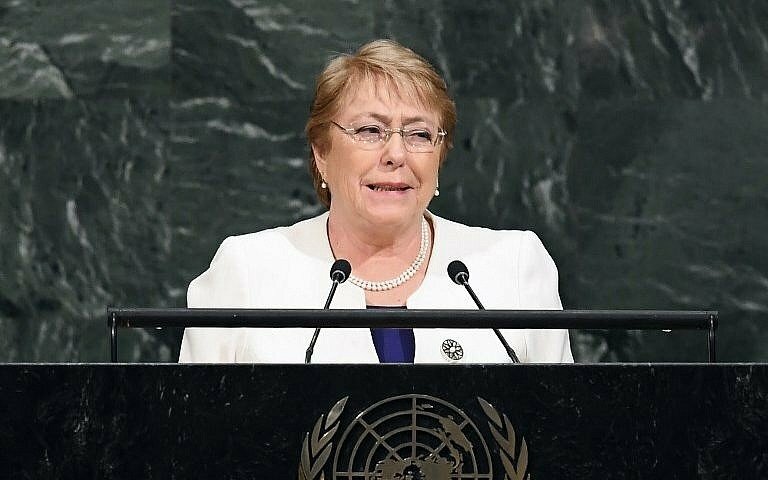 As part of the opening remarks at the 39th session of UN Human Rights Council, in a video which was published on United Nations YouTube Channel, Bachelet said that the people of Kashmir have the same rights to justice and dignity as people all over the world. Bachelet further commented that taking the situation of Kashmir into consideration, the Human Rights Commission continues to request permission to visit both sides of Kashmir’s Line of Control. In the meantime, it will continue its monitoring of reports on the situation at hand. Bachelet’s speech was highly appreciated by the Joint Resistance Leaders (JRL) of Jammu and Kashmir. Calling her speech as a ray of hope, members of the JRL including Syed Ali Geelani, Mirwaiz Mohammad Umar Farooq and Mohammad Yasin Malik said that the speech brings optimism for all the destitute people facing the brunt of human rights violations at the hands of government forces in almost all the conflict zones of the world. Bachelet who is ranked among the world’s most powerful women, is the daughter of the Chilean General Alberto Bachelet Martinez. She was arrested in 1975 under Pinochet's military regime and was held for several weeks at the infamous Villa Grimaldi interrogation and torture centre in Santiago. She returned to Chile in 1979 to finish her medical studies but was prevented from working as a doctor for political reasons. With the restoration of democracy in Chile in 1990 she joined the health ministry, and became the health minister of Chile in 2000. Later, Bachelet became the first female president of Chile, holding the top post twice, from 2006 to 2010 and gain from 2014 to March 2018. The Zaatari refugee camp – in Mafraq (Jordan) – has become almost a permanent home for refugees from the Syrian conflict. Many came here in 2012. Children living and pursuing education in conflict zones are among the worst sufferers of daily violence in their lives.